Margaret I. Butula, 84, formerly of 6th Avenue in Grafton, died Monday, February 13, 2012 at Heritage Health and Rehabilitation Center, Port Washington where she had been a resident since 2010. 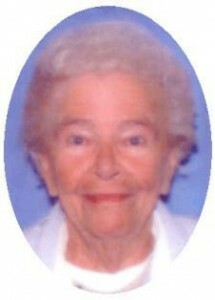 She was born on November 5, 1927 in Milwaukee to Frank and Catherine Kozek Johnson. She worked as a telephone operator when she was young. On September 5, 1950, she married Gustave J. “Gus” Butula of Milwaukee at St. Casimer Catholic Church in Milwaukee. Together they raised their family on Milwaukee’s northwest side. Her husband preceded her in death on June 3, 1991. A short time later she moved to Grafton. She enjoyed playing cards with family and friends, knitting and crocheting. Marge is survived by her sons Tim (Bev) Butula of Colgate, Wisconsin and Tom Butula of Grafton. Further survived by grandchildren Angela and Trevor, brother Leroy (Hazel) Johnson of South Milwaukee, former daughter-in-law Dawn Butula of Grafton, nephew Ron (Kathy) Johnson of Milwaukee, other relatives and friends. The Reverend Mike Barrett will celebrate a memorial mass 5:30PM Friday, February 17, 2012 at St. Joseph Catholic Church, 1619 Washington Street, Grafton. A visitation will be from 3:30-5:30 pm Friday AT CHURCH. Interment will be at Holy Cross Cemetery in Milwaukee.